Download one of the archive attachments containing fixed exes from WSGF. Open FGUY.exe with a hex editor such as HxD. Replace bytes 00 00 80 3F with bytes representing your float value multiplier (default multiplier is 1.0). Remember to invert the byte order to Little Endian. 4 Split-screen. 2 players co-op. Up to 4 players competitive. 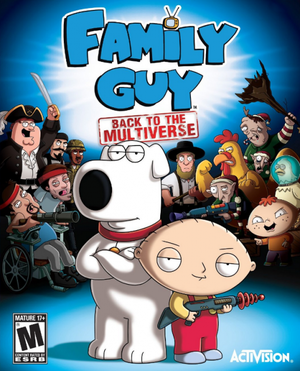 See Helix Mod: Family Guy Back to the Multiverse. ↑ 1.0 1.1 File/folder structure within this directory reflects the path(s) listed for Windows and/or Steam game data (use Wine regedit to access Windows registry paths). Games with Steam Cloud support may store data in ~/.steam/steam/userdata/<user-id>/214230/ in addition to or instead of this directory. The app ID (214230) may differ in some cases. Treat backslashes as forward slashes. See the glossary page for details. This page was last edited on 15 April 2018, at 09:22.